Welcome to our site. We are looking forward to receiving you. 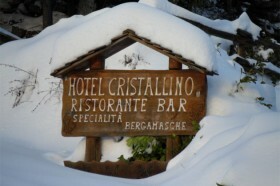 At the foot of Mount Presolana, surrounded by green and peaceful nature, at 1.200m above sea level, there is Hotel Cristallino. It is owned by the Migliorati family who has run it for almost 40 years. The structure was recently extended and largely refurbished. It is an ideal point of departure for excursions and trips to the beautiful mountains and hiking trails. The hotel has 32 comfortable rooms, a spacious dining room that can accommodate 200 place settings, a conference room, private discotheque, bar and TV room with open fireplace, lift, garden, parking area and disabled access. WiFi connection is available in the Hotel common areas. Pets are welcome. The spacious dining room and large comfortable rooms (with 2, 3, 4 beds) make Hotel Cristallino the ideal place for large groups such as families, schools and youth groups.